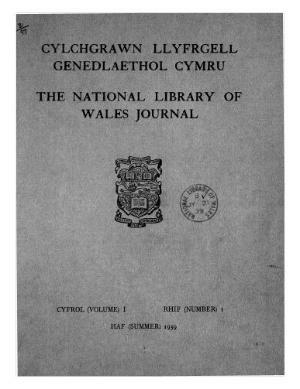 The National Library of Wales journal / Cylchgrawn Llyfrgell Genedlaethol Cymru is an annual journal containing scholarly articles on historical topics relating to the Library’s collections. It contains articles in English and Welsh. When the journal started, two parts were issued annually, forming a four-part volume every two years; since 2004 one issue has been published annually. It was published between 1939 and 2008. Publisher Details: The National Library of Wales was founded by royal charter in 1907 to collect, preserve and give access to all kinds and forms of recorded knowledge, especially relating to Wales and the Welsh people. It is based in Aberystwyth and is now an Assembly Government Sponsored Body. It holds extensive collections of printed books and journals, maps, paintings and archival material.